Due to the very poor customer service standards of Affinity we sought out a better source and started carrying the Jeunique One Day Diet Wafers but unfortunately the owner passed away and the Jeunique wafers became no longer available. Once again we began searching and to our excitement we now carry Whole Family Products 1 Day Diet Wafers in both Vanilla wafers and Chocolate wafers. But don't think that we stopped there. We also have Whole Family Products Diet One Day Tablets that come in 4 delicious flavors. 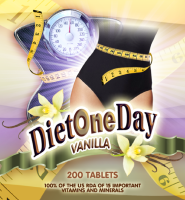 Diet One Day Tablets also come in mini packs which we call Diet One Day Packs which come in Vanilla, Strawberry, Butterscotch and Chocolate flavors. They are great to carry around with you in the convenient case. your choice of Whole Family Products Raspberry Ketone, African Mango, Weightloss Green Coffee, or Acai Xtra for your non-diet days. This is a 1 month supply of One Day Diet Wafers and a 1 month supply of Lose While You Snooze Collagen Weight loss Gel Caps. Lose While You Snooze collagen product with WFP One Day Diet Wafers product.? See how you can lose faster by combining the two. Want more flavors? Try the Diet One Day Tablets available in 4 flavors. Strawberry, Butterscotch, Vanilla, and Chocolate.